Instructors: Dr. Manijeh Motaghy and other teachers. This retreat will be held over four days at Dhamma Dena retreat center in the Joshua Tree desert. Registration opens at 2:00 PM Thursday, October 18th. From 5:00 PM – 6:00 PM there will be a light meal and at 7:00 PM is the opening meditation and introductions. Please give yourself plenty of time to arrive on time and register, get to your room and settle in. Arrive as early as possible on Thursday to register, find your room, settle in and sign up for yogi jobs. This retreat will emphasize on quieting the mind, opening the heart, and developing clarity and depth of practice. Traditional meditation instruction will be combined with a spirit of loving-kindness and silent sitting, walking, dhamma talks and personal meetings with teachers. 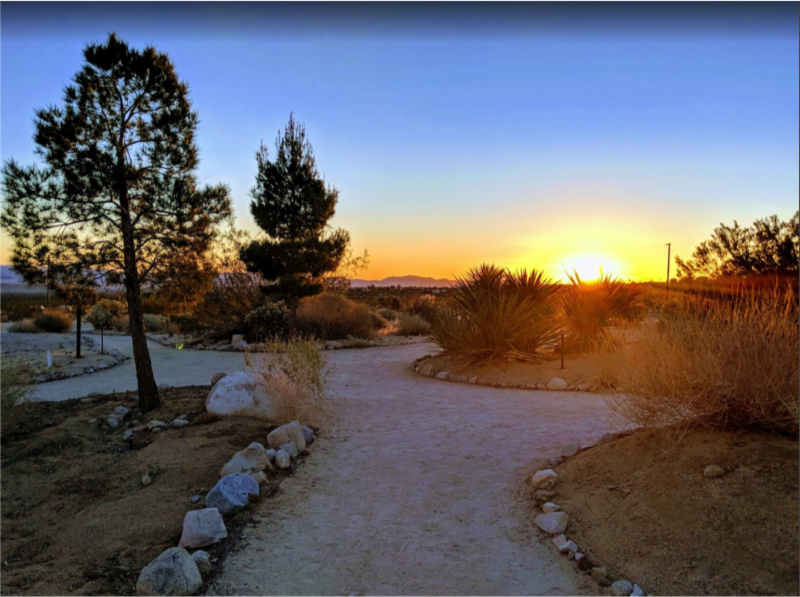 The retreat campus is in the magical deserts of Joshua Tree with a sky filled with stars at night. It is comfortable with all the modern conveniences, heating & cooling, flush toilets, etc. Buildings are mostly old houses, the decor is an eclectic reminder of Ruth Denison, (the founder), and the desert itself is a devouring spirit. They have made a good effort the past couple of years at refurbishing and adding some new features, like an ADA accessible bathroom and big decks for the students to have a little sun- or moon-bath. They are non-profit and care most about people being able to attend, no matter their financial situation. — Please bring scentless products, as it’s a frequent issue that one or more of the retreat participants are sensitive to perfumes and deodorants, scented hair styling products, and soaps. Your personal meditation cushions/benches (the Zendo is well-stocked with a wide variety of these, as well as chairs, so you don’t need to bring your own unless you wish). Gloves, Scarves, rain gear, sunglasses, lip balm, body lotion (skin gets dry in the desert). Refunds must be requested before 5 pm on Friday, October 12 with a $25 administrative fee. There is no refund after this date. We may offer partial credit towards future retreats within 180 days of this retreat. Refunds should be requested by emailing: register@perfectlyhere.org. In the spirit of generosity, we are keeping the fee low for all to attend. The fee covers the cost of food, accommodations and administrative costs. Teachers and the cook are NOT being paid by this fee. At the end of the retreat, you will have an opportunity to participate in this act of generosity and leave a donation for teachers and the cook as your heart is moved. *If you are in need of financial assistance we have a few opportunities for work exchange/volunteer work including someone to cook, assist the cook and assist the teachers. Please write to us if you would like to take these opportunities. Please only do so if you are not able to pay for the retreat. If you are, please let others who are truly unable to take advantage of this. Please make a donation for the teachers separately.